Can you believe Christmas will be here in just 2 1/2 weeks!? That also means my baby will be here in 4-5 weeks! Yikes!! Time to get recipe planning and gift buying! My husband and I will be hosting Christmas Eve dinner at our new house :). This may sound like I am crazy because by then I will be 38 weeks and technically could go into labor at any time. Well, I am taking my chances and hoping Baby S decides to stay where he/she is at least until after New Years. If not, plan B will go into effect. 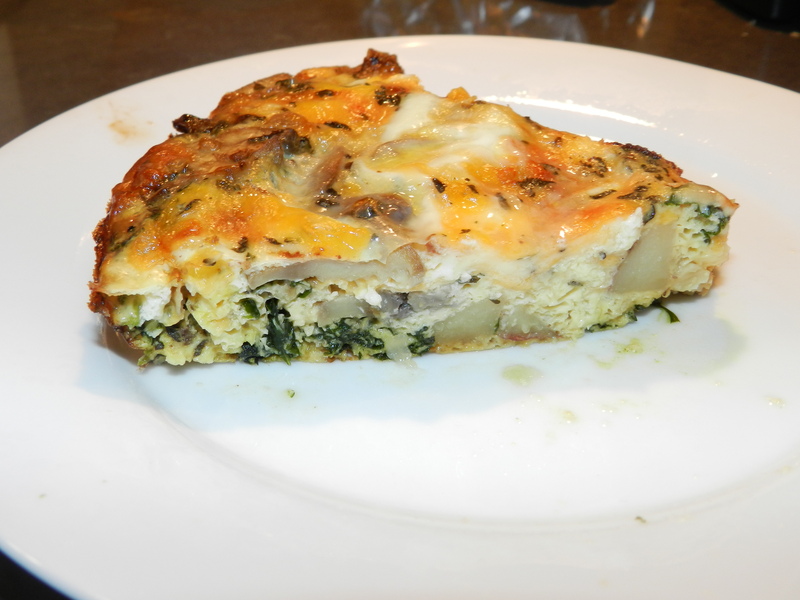 Anyway, since we will be hosting a delicious Christmas Eve dinner, I want to make Christmas morning as easy as possible so I decided I will make this delicious and healthy Kale, Mushroom & Potato Frittata ahead of time and stick in the freezer until Christmas Eve. I have realized over the last few weeks how convenient it is to make meals ahead of time and freeze them. I have been doing this a lot lately and doubling my recipes for dinner so I can freeze some healthy meals for after baby. I figure I will be way too exhausted to cook in the first few weeks and I don’t want to fill up on sodium and fat packed take-out dinners. The goal is to loose the baby weight, not to add to it! So freezing healthy meals from now until baby is my goal. 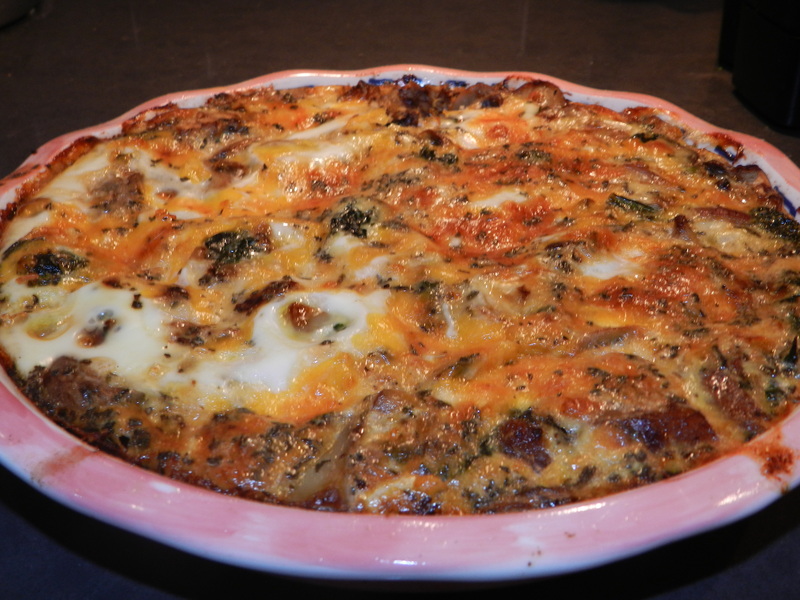 This Frittata is so easy, delicious and healthy. I like that it incorporates potatoes which makes it a little more filling. Usually I am not a huge fan of white carbs, especially white potatoes, but this recipe doesn’t call for many and it compliments the low calorie and nutrient dense kale and mushrooms. Plus, it’s Christmas … gotta indulge a little this holiday season :). In a skillet or dutch oven saute onions with olive oil spray- about 4 minutes. Add diced potatoes and saute until cooked through- about 8 minutes. Add shredded kale and mushrooms. Be sure to add more olive oil cooking spray so it doesn’t stick to the pan. Once mixture is done, pat dry to clear any of the extra water from the Kale. Set aside. Meanwhile, combine basil, milk, salt, pepper, eggs and egg whites. Whisk everything together and add shredded provolone cheese. Add kale and potato mixture to an oiled round (pie) dish. Cover with milk and egg mixture. Top with bread crumbs and cheddar cheese. If making for that day go ahead and cook for 25 minutes. Otherwise, place a tupperware lid on top of dish and put in the freezer. Take dish out of the freezer the night before you would like to cook it. Let thaw in the refrigerator overnight and cook in the morning at 350 degrees for 25-30 minutes. This entry was posted in Food, Uncategorized and tagged Christmas Brunch, healthy breakfast, healthy living, healthy recipes by find your healthy haven. Bookmark the permalink.